April 16, 2019 by Feral StrumpetLeave a Comment on Argyromancy, or What the Silver Told Me. We are excited to announce we now offer FREE SHIPPING on all jewellery orders to the UK as well as to our friends in Europe in both our Independent shop, Feralstrumpet.co.uk as well as our Etsy Shop! Join our mailing list and give us your birthday (just the day and month) for a special birthday treat! Also by joining our email list you get special discounts, shop updates and sale previews. Sign up here. This year I will be taking part in the North East Open Studios arts festival in its 15th year. 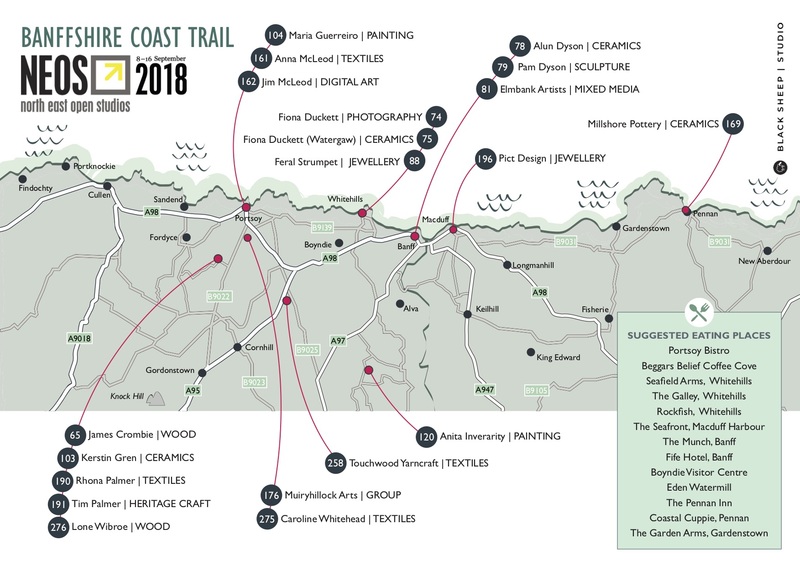 Artists across Aberdeenshire have opened their studios to the public for nine days in September, to celebrate the wealth of artists, craftspeople and makers in this area of Northern Scotland. This will be my first year at NEOS and I’m honoured to be showing my work with potter Fiona Duckett at her beautiful studio and gallery in a converted chapel, Watergaw Ceramics. The gallery will be open September 8th-10th, and the 13th-16th from 10am to 5pm. You can also join us on the opening Saturday the 8th for special libations and some music in the late afternoon from Gerald Duncan on guitar and Neil Hankin on banjo. To find out about the myriad artists and makers taking part in NEOS this year, you can download the PDF of the book here. Find below the local Banffshire Coast map. Next week, Etsy is celebrating 13 years of supporting handmade businesses by hosting a site-wide sale, and I’m participating by offering 15% off my entire shop from June 18th-22nd. No coupon is necessary. (Custom orders and made to order designs are not included in the sale). Good old days– this was my first Etsy banner. Maybe some of you remember it! One of my first product photos, before I figured out how to use a camera. I still make & sell these Zombie Gnome earrings in my shop! I’ve had a handmade shop on Etsy for over 8 years of their 13 year history, and before that I was an Etsy customer. Back then, things were small– crafters and artisans offered a few of their wares and there was definitely a feeling of unique, experimental sharing. Many of the shops I visited were like me– making things on their kitchen tables, photographing them with a dinky point-and-shoot camera. As Etsy grew, many businesses, like mine, grew with the site, and the decision-makers at Etsy seemed to be makers themselves, or at least understood the unique dilemmas makers face when running a business– Etsy supported us and we blossomed. Many of us were able to support ourselves by selling our work; a truly marvellous thing. I met other shop owners who remain friends to this day and we continue to support each other in myriad ways. There was a community of sellers sharing knowledge in Etsy Teams, and we celebrated each other’s work by making Treasuries– visual collections of selected pieces that would sometimes be featured on the front page, leading to great exposure for everyone, and a constant source of inspiration and friendship. The Chartres Labyrinth Necklace is featured in this Solstice Meditation Treasury from 2011. I still offer this necklace design in my shop! The Folk Reveries Team on Etsy was my favourite. Of course nothing stays the same. The CEO of Etsy changed, and those of us who made a modest living had to hang on for dear life– despite Etsy’s “Quit Your Day Job” blog posts, those of us who had done just that knew that it harder for us succeed. Etsy had opened its doors to resellers and drop-shipping, and suddenly we had to compete with people who were not making their goods at all but buying them from the 3rd world, often from sweat shops employing child labour. Etsy has had a crisis of identity: the front page is no longer curated by Etsy members via the Treasuries. Long time Etsians have noticed the site looking more and more like eBay. Also since Etsy has gone public on the stock market it must now answer to share holders rather than makers, and this has changed everything. That time I modelled as Gunpower Gertie for Catrianna of Deep Midnight Perfume Oils on Etsy! (this is an outtake). Be ready to spend at least half your productive hours creating a business. This involves trying to anticipate Etsy’s continued changes as you think on your feet. Lastly, loyal customers are like gold, and if you have read this far, I know you are one of them. Every day I am filled with gratitude for the customers who continue to return to my shop, year after year. Without you, I wouldn’t be here!